Stuart Surf Design is an online merchant and store located in Australia. We do not ship goods outside of Australia. 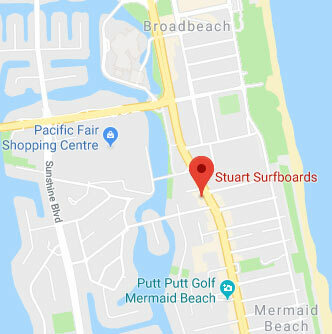 If you live outside Australia and would like to enquire about our product range at Stuart Surf Design, please contact stuartsurf@hotmail.com. We endeavour to take the utmost care to pack your order for delivery and we trust our delivery providers / couriers will strive to ensure the same level of care we put into these items. Once your order leaves our store premises, liability for any damage affecting the product lies with the delivery service provider which means Stuart Surf Design is not liable for any damage that occurs in transit. If your item is damaged in transit, we are more than happy to assist in any proceedings which may be a result of the delivery service provider. Please ensure you check your item for damage before signing for the delivery and advise the delivery person if you find damage immediately. To ensure we can resolve any issues with your order, please contact us immediately if you find it damaged. We will strive to assist you where possible, however cannot guarantee results as this will need to be negotiated with the delivery service provider. If you have received a damaged good and have accepted the delivery, please email stuartsurf@hotmail.com and we will organise to assist. Delivery times will vary depending on the product you have ordered. For all items we will organise a tracking service so you can see when your item is expected to arrive. Accessory orders are sent Australia Post standard with a flat postage rate for $10 for accessory orders only and your order will be actioned within 48 hours. Most surfboards are made to order with an estimated three to four week turnaround on crafting the surfboard once the order is placed online. This excludes shipping time depending on your delivery location. Most stock held in store are surfboards without artwork, if you would like to check the availability of a surfboard model in store before you order please contact us by phone with the specific surfboard model name, height, width and volume you are seeking. Surfboard shipping price and shipping time varies by your location, check the table below for reference. Deliveries must be signed for and they cannot be left by the courier. If you will not be at your home address please provide an alternate delivery address such as a work or friend/relative, if this is not possible, a calling card will be left by the courier in your letterbox, and you will be prompted to contact the freight company for re-delivery. Sometimes, this may incur a fee. We aim to ensure all products listed on our website are currently in stock and pricing is correct. In the event an ordered item is not available, or we are unable to fulfil your order, we will notify you within two business days to organise a backorder or a refund. We will maintain email communication with customers who have purchased items throughout the process. You will receive an email once your order is placed / confirmed, another email with an update about your order if you have ordered a custom surfboard and another email to notify you when your item has been dispatched which will include a tracking service / number so you know when your item is expected to be delivered. If you order two or more surfboards, after the initial shipping cost for the first surfboard it will be an additional $30 per surfboard. All accessories are a flat rate of $10 for shipping. If you order multiple accessories only, you will only be charged the flat rate of $10. If you order any accessory/s with a surfboard purchase, you will only be charged the shipping cost for the surfboard/s. We respect the privacy of your personal information. This Privacy Statement sets out our policy on dealing with personal information we collect through our website – stuartsurf.com.au. Under the Privacy Act, ‘personal information’ means information which identifies you as an individual or from which your identity can be reasonably ascertained. We collect personal information from you if you register for any service on our website – either if you input any personal details into a contact form or are a customer. We collect your personal information to process orders, improve the service and to communicate with you. In special circumstances, we may also use and disclose your personal information for purposes relating to law enforcement and investigations, protecting our lawful interests. We may not be able to do these things without your personal information. For example, we may not be able to deliver and track your order or contact you. We may update this Terms & Conditions section from time to time by publishing a new version on the Website. If you are a visitor of the Website, you should ensure that you are familiar with the current version of this Privacy Statement. Address: 2576 Gold Coast Highway, Mermaid Beach QLD 4218. For general privacy information, or if your concerns are not resolved to your satisfaction, you can contact the Office of the Australian Information Commissioner on 1300 363 992 or via oaic.gov.au.